Rock Church and Helsinki Cathedral are good opportunities to explore the local culture. 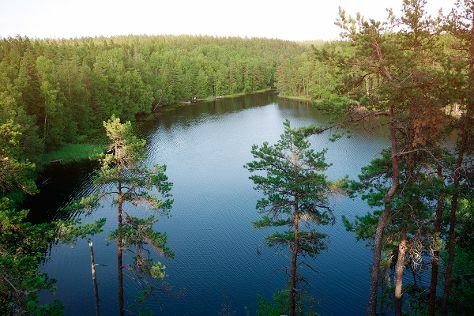 Kids will appreciate attractions like Nuuksio National Park and Hietaranta Beach. Explore the numerous day-trip ideas around Helsinki: King's Road (in Southern Finland), Teijo national park (in Pernio) and Sipoonkorven Kansallispuisto (in Vantaa). Pack the 8th (Thu) with family-friendly diversions at Linnanmaki Amusement Park. Next up on the itinerary: brush up on your military savvy at Sea Fortress Suomenlinna, take in the spiritual surroundings of Uspenskin Cathedral (Uspenskin Katedraali), admire the masterpieces at Design Museum, and appreciate the extensive heritage of The Esplanadi Park. If you are flying in from Israel, the closest major airport is Helsinki Vantaa Airport. In August in Helsinki, expect temperatures between 24°C during the day and 13°C at night. Finish your sightseeing early on the 10th (Sat) so you can travel back home.